With her trademark emotional vulnerability and technical wizardry, violinist Lucia Micarelli graces the stage with her band, Thursday, January 25, 2018 at 8:00 p.m. at Diana Wortham Theatre in downtown Asheville. From classical to traditional Americana, and with a full accompanying ensemble on violin, viola, cello, piano, and bass, Lucia enthralls her listeners with exquisite poise and remarkable skill. Lucia captivates audiences as she blends her classical roots with her visionary style, moving through multiple genres with grace and energy. Joining her on stage at Diana Wortham Theatre is Neel Hammond on violin, Zach Dellinger on viola, Vanessa Freebairn-Smith on cello, Ian Walker on bass, and Robert Thies on piano. As a performer of vast talent and artistic style, Lucia has made a name for herself with her passionate stage presence and versatility as a musician. 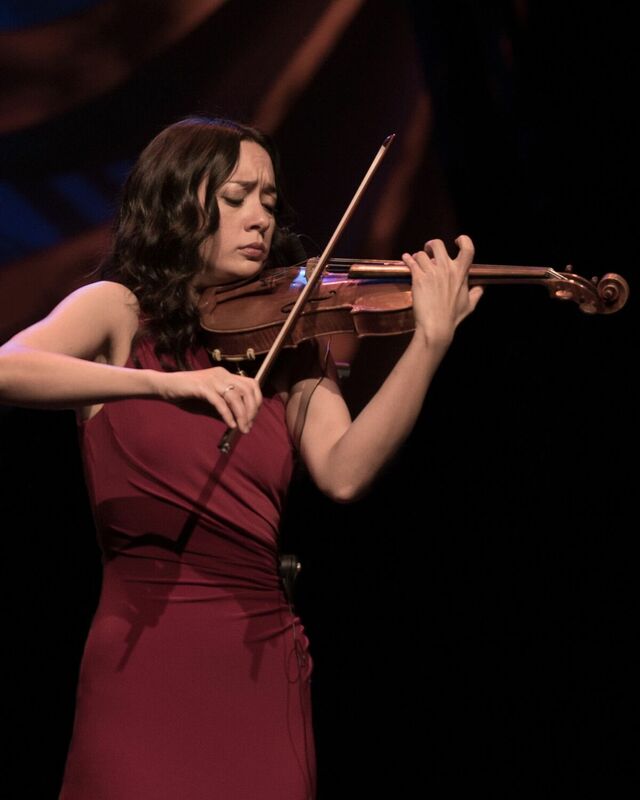 Accepted into the Juilliard School of Music’s Pre-College Division at age 11, Lucia participated in and won dozens of international competitions and performed extensively throughout the United States. In 2001, when she left Julliard to attend Manhattan School of Music, she began to discover music outside of the classical genre. By day she studied with celebrated international violinist Pinchas Zukerman, but by night she explored jazz and rock music’s experimental scene in the clubs of New York City. Her classical training provided her with a unique foundation to explore her growing interest in these new genres. This led her to accept an invitation to tour with the Trans-Siberian Orchestra, a rock opera named one of the top ten touring acts of the last decade by Billboard Magazine. Over the last ten years, Lucia has been a featured soloist in two of Josh Groban’s world tours; has toured extensively with trumpeter Chris Botti and was featured in his “Live From Boston” PBS special; was featured in Barbra Streisand’s 2013 international tour; and was cast in the starring role of Annie in HBO’s critically acclaimed series, Treme, which ran for four seasons and won a Peabody Award as well as a Primetime Emmy Award. Lucia also released two solo albums, Music From A Farther Room and Interlude. Lucia Micarelli’s January 25 performance at the Diana Wortham Theatre is made possible by Performance Sponsors Asheville Music School, Carol and Bob Deutsch, Nancy Houha, and Ed & Vicki Jenest; and by Mainstage Music Series Sponsors Bank of America, JAG Construction, Merrill Lynch, Mosaic Realty, Signarama, Henry LaBrun, and Dianne & David Worley; with additional support from Media Sponsors The Laurel of Asheville magazine and Blue Ridge Public Radio. To obtain more information on the Mainstage Series or to purchase tickets for the January 25, 2018 performance by Lucia Micarelli (Regular $35; Student $30; Child $20; Student Rush, day-of-the-show with valid I.D. $10), call the theatre’s box office at (828) 257-4530 or visit www.dwtheatre.com.